This handbook contains 60 questions (and a set of typical answers) that intending speakers for the party may be asked when they are examined. In practice the examination of a new speaker is usually concluded in approximately 1¼ hours, meaning that only 20 or so questions are asked and answered. Candidates may expect questions in any order and should be ready to give explanations on matters arising. Candidates should attempt to answer the question rather than tell the examiners everything they know about a particular subject. This handbook is not a catechism to be learnt by heart and parroted. Its purpose is to provide a handy refresher for those members who cannot get to speakers’ classes, but wish at some time to take the new speakers’ test. Neither is this a final product; subsequent editions with clearer and better answers are envisaged. No references are provided as intending speakers are expected to be familiar with all our pamphlets, a lot of our journal publications and the basic works of Marx and Engels, as well as having a general knowledge of history, politics and economics. The examiners make allowance for nervousness. So, if you mess up an answer, just apologise and have another go. If you don’t understand what a question is getting at, say so; the examiners will always rephrase it for you. Don’t expect the examiners to tell you that the answers you give are correct and don’t be put off by long pauses between questions – the examiners have to think about these things too. At the end of this handbook there is a page of advice for aspiring public speakers. 1. What is the basis of society? This is a general question about all societies. But start from the present and consider our first principle:– “Society as at present constituted is based upon the ownership of the means of living…” If you state what capitalist production relations are in a simple way (minority class ownership means the majority must sell their labour power for a wage, while production is geared to profit for the few, resulting in human needs not being wholly satisfied) then the basis of society is clearly the relations formed by people in getting their living using some means of production. In technical terms, there are certain modes of production found in history, whose constituents are forces of production and relations of production. The link between these two is that the relations of production correspond to the stage of development of the forces of production. This is not technological determinism, where all other aspects of society are mere reflexions of the forces of production. Rather, the correspondence between forces and relations of production takes place through the mediation of the class struggle and the balance of class forces. For instance, China’s rise as a capitalist super-power has taken place mainly through the Chinese state’s ruthless use of cheap and plentiful labour power, rather than developments in its productive technology. 2. What forms have society passed through? You are required here to expand upon the first answer, where you explained the current form of society. Working backwards from capitalism: there was feudalism – where aristocrats owned most of the land and peasants were tied down to that land by a host of restrictions, including the requirement that they did unpaid labour for their liege lords. There was slavery – where the bodies of the producers were the property of slave owners and were bought and sold like land or goods. There were various types of primitive society – the key one being the primitive communistic tribal form, where localised common ownership was practised. Before that the tribal form of society shaded off into loosely associated groups of Homo sapiens or hominids. This standard typology of social forms is based upon Marx, but leaves out a stage that he called “the Asiatic mode of production” (sometimes called “oriental despotism”); a system where millions of peasants are engaged under military pressure to raise water for the irrigation of crops. In some ways the typology focuses upon Europe too much, as the slavery of classical antiquity rarely spread beyond the Mediterranean coastal areas. Other expansions of the forms of society may include palaeolithic and neolithic. Whichever set you choose, remember that the causes of social development reside in history, not in any classification of stages. 3 .What is the materialist conception of history? Now generalize upon your last two answers. The development of social relations through time goes hand-in-hand with the deve1opment of the technical means for producing the wherewithal to live (forces of production). For instance, steam-powered industry developed and made feudal relations incompatible with large sectors of production. Consequently a struggle developed between the aristocrats and the industrialists, resulting in the latter gaining mastery of the state in a political way (and also marrying into the aristocracy). The materialist conception of history reduces esoteric and idealistic statements about history and social change down to basic statements about classes, their property, the types of production and social relations that they favour. 4. What is the class struggle? Quite simply it is the dynamic of history since the rise of private property. More fully it is the conflict of material interests existing between classes in society. In capitalism this gives rise to strikes and lockouts, trades unions, employers associations and the political parties of capitalism, who try to stop the class struggle from disrupting society. Contrariwise, the socialist party is an expression of the material interest the workers have in ending the class struggle by pursuing the class struggle on sound lines towards the classless society of socialism. 5. What was (a) the English Revolution, (b)the French Revolution, (c) the American War of Independence, (d) the American Civil War, (e) the Russian Revolution, (f) the Chinese revolution, and (g) the Iranian revolution? (a) The English Revolution was the political expression of the bourgeoisie that they would no longer tolerate an absolutist, feudal monarchy and wanted freedom for the development of trade and industry. To which end they enlisted the support of smallholders, yeomen, burghers and others in a civil war and a prolonged campaign, until in the end a compromise was reached in the settlement of 1688, when a constitutional monarchy was formed. (b) The French Revolution was the other side of the same coin. It was a political expression by the peasants and workers that they would no longer tolerate the conditions and restrictions forced upon them by the monarchy. Once the Bastille was razed and Paris seized, the bourgeois (little and large), lumpen proletariat and others all joined the momentum for change. A range of republican and democratic state organisations were tried until a strong dictatorship formed around Napoleon, who helped to organize France into a nation-state that could challenge Britain, Austria, Germany and Russia. (c) The American War of Independence was a straight fight by the colonial capitalists to win independence from British imperial power. The colonial capitalists orchestrated protests against taxes (Boston Tea Party), to using republican support for the French Revolution as a spur to get frontiersmen to fight the invading British army. Eventually the supply lines of the British broke down and the cost of shipping men and supplies across the Atlantic became so great that Britain sued for peace. (d) The American Civil war arose when the southern plantation-owning capitalists tried to secede from the American federal union of states, because they wanted no taxes and free trade with Europe for their cotton goods. The northern states wanted protective tariffs for their new manufacturing industries and a banking system that would allow investment in railways and other large undertakings to proceed. After four years the industrial might of the northern states prevailed. Also, the cotton planters kept taking virgin land, cropping it to exhaustion with imported slave labour, threatening the free labour of the northern industrialists. So the south was on a collision course with the north from several directions. (e) The October 1917 (November according to the modern calendar) Russian Revolution was a coup by the Bolsheviks led by Lenin. The Tsarist regime lost almost all support after its disastrous military prosecution of the First World War, leaving the economy and state machine shattered. The Bolsheviks took the opportunity to gain control of the soviets and, through them, the state. They promised the workers and peasants “peace, bread and land.” They then established a dictatorship over the proletariat and peasantry. The Socialist Party has always rejected the idea that the October revolution has any claim to be socialist or a step towards socialism. (f) In 1947 civil war broke out in China between the Communists, led by Mao Zedong and the nationalist Kuomintang, led by Chiang kai-shek. In 1949 Chiang kai-shek and other Kuomintang leaders fled to Taiwan. Later that year Mao proclaimed the inauguration of the Peoples’ Republic of China. Mao modelled the development of Chinese industry on Russian State capitalism, and this model of development continued after the Sino-Soviet split in 1960. Since Mao’s death in 1976 the development of capitalism in China, on a more market-orientated basis, has continued under the control of the Chinese Communist Party. (g) The Shah of Iran was a stooge of western governments, there to guarantee oil supplies. The Shi’ite sect of Islam to which most Persians, workers and capitalists, formally belonged provided the unifying oppositional ideology. The ideology used to remove the Shah therefore took the form of a militantly anti-western Islam. For many muslims the Iranian revolution of 1979, which deposed the Shah and his regime, was an Islamic revolution. “Islamic fundamentalism” then spread through the Middle East and beyond, exacerbated by a growing resentment at American imperialist involvement in Palestine/Israel. A product of human labour, acting upon nature-given materials, that is capable of satisfying needs. This identifies wealth with use-value. But capitalism is a society where wealth becomes a commodity having exchange value also, and sometimes only a socially-bounded use-value that is peculiar to this society – as with nuclear weapons. A social relationship between people which expresses itself as a material relationship between things. The value of a commodity is determined by the quantity of socially necessary abstract labour time needed for its production and reproduction. Price is the monetary expression of value. 8. What is exchange value? A relative magnitude which expresses the relationship between two commodities. The proportion in which commodities tend to exchange with each other depends upon the amount of socially necessary labour-time spent in producing them. Commodities actually sell at market prices that rise and fall according to market conditions around a point regulated by their value. 9. What is surplus value? That part of the labour of the workers which is unpaid. This is the key to exploitation. The value of the bundle of commodities workers buy with their wages and salaries must be compared with the value of the bundle of commodities that they produce in their work. The difference between the two is the source of surplus value. Think about it this way. What you can buy with your wages represents the value of your labour power, but your employer buys your labour power and receives the full product of your labour as a result of the wage bargain you must make. In part the class struggle is over relative surplus value (speeding-up and increasing output), and absolute surplus value (the lengthening of the working day). See also number 14. 10. How is surplus value split up? In a typical example from manufacturing industry the industrial capitalist will pay rent to the owner of the land where the factory is built, will pay interest to the financiers and will be left with some profit. This division of surplus value is known as the capitalist trinity – rent, interest and profit. The many forms of interest that abound in modern finance are surplus value variously transformed. 11. Do articles sell at their value? By accident – or on average over the range of a trade cycle – some articles will sell at their value. To demonstrate that an article does sell at its value requires a sophisticated analysis, ranging from calculation of embodied labour time, to averaging of the rate of profit by sharing of surplus value among the various sections of the capitalist class. Complicated, but still a determinate social process. You can display your practical knowledge more easily if you state the conditions where commodities do not sell at their value. The best examples come from the state monopoly of customs and excise – tobacco and alcohol products regularly sell at prices far above their value. Other examples can be found in the history of capitalism where products from the staple diet of the workers (e.g. milk and bread) sold at prices below their value because of government subsidies. These latter have the effect of holding down the price of labour power (wage or salary) and in the longer term lowering, or holding back an increase in, the value of labour power. 12. Is there any value in an hour’s labour? This is an artful question designed to see whether you fall for “Senior’s last hour”, the argument that all the profit of the capitalist is generated in the last hour or so of the working day. Senior, an economist of the nineteenth century, used it to suggest that any reduction in working hours would wipe out all profit. The answer is that exploitation goes on throughout the working day. Consequently there is, proportionately, as much surplus value in an hour’s labour as there is in a working day or week. 13. Will value exist under socialism? No. Value exists only under certain social conditions and relationships, where things (including human labour power) take the form of commodities to be bought and sold on the market. In a socialist society there will be common ownership, and so no commodities, just freely given and taken services and. products. So exchange value will not exist, the law of value will not hold – leaving only use value. All production will be for use, or for the satisfaction of human need. 14. What is socially necessary labour? Socially necessary labour is what determines the magnitude of value of a commodity. It is the minimum required labour time, under average social conditions of production, that is taken to make a particular commodity from start to finish. Time-wasting does not increase value of course, but all productive labour is socially reckoned. For if after three days work you have produced sufficient value to replace your wages, you must continue working of course, but if the workers in the factory down the road can reproduce the value of their wages in 2 days, while producing the same product, then one day of your work is not socially necessary, and you are working for a doomed company. Necessary labour is that required for a worker to produce the value of commodities equal to the value of wages received. But the worker continues beyond this period to produce a surplus product. This kind of labour is called surplus labour and is the source of surplus value. The unpaid labour of the working class. Earlier it was stated that the accumulation of surplus value is the keynote of capitalist production. The component of surplus value accruing to the industrial capitalist, after rent and interest have been subtracted, is profit. But by means of preferential taxes, subsidies and government payments, the actual profit of a company may differ widely from what the conditions of production and the market may provide. They are the monetary reflection or money-form of value. The market price of a commodity oscillates around its price of production. This locus being equal to the cost of production plus the average rate of profit. Such a cost of production includes the wear and tear on machinery and buildings used, the raw materials consumed and the wages advanced (constant plus variable capital). Profit is not created by pricing policies, nor by capitalists buying cheap and selling dear (even if individual capitalists can get rich this way). Exploitation takes place in production, as the goods roll off the production line they contain already the elements that will be realised in the market. Wages (and salaries) are the price of labour power; they are a monetary quantification of the value of the means of subsistence for the worker. It’s worth saying here that the subsistence of the workers is a peculiar set of values into which historical factors intrude. The standard of living (or average subsistence) of the French worker includes the cost of so much wine, while that of the British worker includes the cost of so much beer. 18. What is labour power? The skill or ability to work that we sell to employers and the sole value-creating factor in production. Labour power is a person’s manual and intellectual skill to work in the production of values. It is a characteristic feature of capitalism that labour power is a commodity, it being the productive source of all new value. The value of raw materials consumed in production is just transferred unchanged to the product. All members of the working class sell their labour power (the state of trade permitting) but not all are involved in the creation of new value. There is productive and unproductive labour. The non-productive labour of the state machine, for example, is paid for out of profits from productive labour. 19. What determines the price of labour power? When the price of labour power is equal to the wage received then it corresponds to the value of the means of subsistence. But what determines that price is the relative strength of the contesting forces of capitalists and workers. But there are limits both ways. If wages fall markedly below the value of labour power, then the workers deteriorate and cannot do their jobs. While if workers push wages far above their value, then profits disappear and capitalists go bust. In general, the value of labour power is determined in the same way as for all other commodities, by the amount of socially necessary labour time embodied in the production and reproduction of a worker with a particular level of skill. Its price reflects both that and the result of the economic class struggle. Different groups of workers get different wage levels because their skills are different, some being more valuable than others. 20. Do real wages fall? Yes they can, and have done so many times in the history of capitalism. Real wages are wages in terms of value, expressing the quantity of stuff they can buy. Because real wages are determined by the class struggle and history in part, they do not automatically adjust to the cost of living. They can fall because of a rise in the price of gas; or fall because they fail to keep pace with inflation; fall or rise in depressions and booms, and so on. 21. 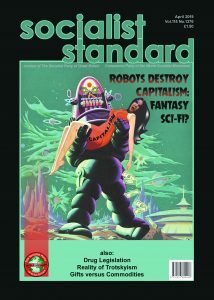 What is the standard of living? The average value of the the goods and services required for living in a particular society. The standard of living is a rough measure of the use values consumed by people (whatever their occupation) in that particular society. It does not usually refer to a qualitative thing, like the quality of life. The standard of living varies geographically and historically. It varies between the African worker and the European worker, while the Italian worker of today has a higher standard than the Roman slave did. 22. Is over-population a myth? Yes. In the late eighteenth century the Reverend Malthus argued that population growth would always tend to outstrip growth in the means of subsistence, resulting in periodic famine. But growth in the means of subsistence has been more than enough to feed the world’s rapidly growing population, and where famines have occurred it has clearly been due to poverty and inability to pay for food. At times under capitalism there seems to be overpopulation and at others underpopulation. But this has nothing to do with the birth rate; it is a consequence of the business cycle. In depressions there are more people than jobs offered by capitalist industry. In booms, on the other hand, there is a comparative shortage of workers (as in the years after the Second World War when immigrants were recruited to make up the shortage in Britain). Wealth used in the production of more wealth as values for sale on the market with a view to profit. Capital (like other terms in political economy) is a social relation between people (wage labour and capital) that appears to be a relation between things (commodity fetishism). It is not a “stock of wealth”, nor “machinery”, but exists on the presupposition that goods are produced for profit. Capital has existed in minor ways for centuries prior to capitalism, as merchant’s capital for instance. But in the capitalist mode of production capital is invested in production and takes two forms: constant capital (labour-time congealed in machinery, heating, raw materials, etc.) and variable capital (wage labour). 24. Are we ‘left wing’? No. The left wing either stand for reformism, revolutionary violence or the leadership principle. They generally reject the socialist argument that the working class can become socialist before the establishment of socialism. To associate ourselves with the left wing would only create confusion. 25. What is the function of trade unions? To press for better wages and conditions and to resist the encroachments of capital. Trade unions organise workers and are organised by them, because workers cannot deal with capitalism individually, but can prosecute the struggle against capital more efficiently when combined. Unions can more successfully press for wage increases (or smaller reductions) and better conditions of work than workers not collectively organised. They may succeed, but are always having to defend their gains. The economic aspect of the class struggle is endless under the wages system. It’s possible also that collective behaviour in trade unions may help to bring about full class consciousness in the socialist sense, for some workers. 26. Do we support trade unions? Careful here. We support democratic action by unions that is conducted on sound lines (see also above and below). But when unions get involved with government pay policies, legislation on the control of strikes, wages and arbitration, or legal action against other unions, then we want nothing to do with them. It should be remembered that there will be no economic basis for the existence of trade unions in a socialist society. Socialist Party union members opt out of paying the political levy to the Labour Party. 27. Do trade unions take part in the class struggle? Yes. They play an essential part in the economic aspect of the class struggle. If workers are not prepared to use unions to challenge employers over pay and conditions then they will never rise to the point where they can challenge capitalism politically. Our general attitude to strikes is that they should be controlled by workers on site, with strike action being democratic, i.e., vote to go out and vote to come back. On no account should these decisions be left to leaders. Legislative and other enactments forced upon or necessary for governments in running the various forms of capitalism. A typical major one was the introduction of the British National Health Service in 1948. It nicely represents the contradictory nature of reforms. For the Health Service is a “patch ’em up and get ’em back to work” institution; it contributed to raising the standard of living for many workers, but was used by governments to hold down wages and has become a bargaining counter used by the various capitalist political parties ever since. 29. Do we oppose reforms? We are opposed to reformism – the policy of advocating reforms, either as a way of ‘improving’ capitalism or as a means to socialism – but we are not necessarily opposed to individual reforms which may be of benefit to the working class. However we do not advocate any reform, because we hold that to do so would lead to a socialist party changing into a reformist party, attracting the support of non-socialists. It is true that some reforms benefit some workers, but they may also benefit sections of the capitalist class. The pro-capitalist argument for Family Allowances in the 1940s was that the employer paid the rate for the job (including an increment to cover a wife and children) even when most of the male population were unmarried. The Family Allowances plan was a scheme based on targeting provision on those workers actually with children. This reform allowed employers to make wage reductions for workers without families. 30. What are crises and their causes? Economic crises are the sharp break when a boom ends, leading to a recession or slump. They are an inevitable feature of capitalism though are not always predictable because of the unplanned nature of capitalism and the ‘anarchy of production’ that occurs because of it. Crises and slumps are usually caused by a disproportionate over-expansion of certain industries, typically those that have grown rapidly during the boom phase of the trade cycle. If the over-expansion of these industries is sufficiently great for market demand, commodities lie unsold, profit rates fall, and unemployment starts to rise, so that what is a crisis of one of more sectors gets transmitted to the rest of the capitalist economy (exacerbated by the unstable forces of money and credit). This gives rise to the classic capitalist contradiction of scarcity born out of abundance. Crises are normal for capitalism and their occurrence does not mean that something has gone wrong. On the contrary, they are a normal ‘purging’ function of the system, ridding capitalism of inefficient units of production. Where slumps do not fully occur for some reason (i.e. the state control of the former Soviet Union) this purging effect is lost, affecting the long-term growth of the economy and possibly leading to economic stagnation. 31. Do wage increases cause price increases? Wages are themselves prices, the price of labour power. Unless market conditions change in their favour, they are a monopoly or in receipt of government subsidies, businesses cannot raise prices merely because they have had to pay higher wages. If employers could recoup wage increases by raising prices, there would be no point in their resisting wage claims. The fact that businesses do resist wage claims is because they increase costs and reduce profits. 32. What is the cause of inflation? Inflation (properly called currency inflation) is the result of the action of governments printing and putting into circulation an excess issue of inconvertible currency. This injects purchasing power into the system that does not correspond with the production of value. Nothing else (bank deposits, credit, etc. has this property). The required amount of currency in an economy rises with the growth of population, production and trade, and can fall with monetary developments such as the use of cheques and credit cards. But a persistent increase in the cost of living is the sole responsibility of governments when they issue more currency than is needed for economic transactions to take place. There are other factors affecting prices too. During periods of good trade prices rise and during periods of bad trade they fall. And an individual monopoly can charge a higher than normal price for its products. 33. Do the rich still get richer? Yes. Figures provided by the UK government (Social Trends 2007) show that wealth accumulated by the wealthiest 1% of the population increasing to 24% of all wealth in 2002, while the bottom half of the population owned only 7% of total wealth. Government statistics consistently show the top 5% of the population owning more than 50% of total wealth; that is, more than the bottom 95% of the population. Government statistics for national income, however, should be used with caution as they tend to not take into account the extent which capitalists will disguise their sources of income (tax havens, offshore trusts, etc.) to reduce their tax liability. Taxes are compulsory monetary payments to the state imposed by the government. Whether direct or indirect, they are ultimately a levy upon property. You must distinguish between taxes upon company profits (an obvious levy upon property) and taxes upon income from workers, which are a mere bookkeeping phenomenon, being deducted at source. In each case the things to keep in mind are real profits and real wages. Company taxation is necessary to fund state activity and is used to spread surplus value among the capitalist class. Just which sections of the capitalist class should get preference over taxation often constitute the main differences between capitalist political parties. Workers only benefit temporarily from reductions in income tax since, when given, they are always taken into account in wage bargaining about the price at which labour power sells. So we say taxes are not a working class problem. The appropriation of a section of industry or the market by a section of the capitalist class. Equally, this can be done by the state in the place of the capitalists – the former National Coal Board, British Rail and so on. Three forms of monopoly seem general. There is private monopoly of a thriving industry for the purpose of cornering the market and achieving a higher than average rate of profit. There is (or has been) state monopoly of a run-down industry like railways, without which no nation can survive. There is state monopoly control over certain commodities with a huge steady market, like tobacco and alcohol, where the state often curbs the size of profits with high duties – customs and excise. The normal attitude of strong states towards those they think are weaker. We repudiate the Leninist view of imperialism as the highest stage of capitalism; with its political follow-up of “the right of self-determination for colonial peoples,” and an “aristocracy of labour” in the imperialist countries sharing in the exploitation of workers in the colonies. Socialism is possible on the basis of the nation states as they are; new states do not have to be established or re-arranged before socialism can be established. Workers in the more developed countries can only get paid more or less the value of their labour power; if they get paid more than workers in less developed countries this is because of the more developed forces of production. Imperialism has no special connection with “late capitalism,” as territorial conquest dominated late seventeenth century mercantile capitalism. Imperialism was again to the fore from the middle of the eighteenth century and until the and of the Napoleonic wars. Then there was a lull until the “race for Africa” in the 1870’s. 37. Is capitalism likely to collapse? No. Blow itself up, maybe. Stagger from. one crisis to another, yes. But collapse of its own accord, no. It has to be brought to an end by conscious, democratic revolution. Collapse theories become fashionable during depressions, often promoted by left-wingers who imagine socialism rising from the ashes. For capitalism to collapse it would require that across the whole range and geography of investment capital no longer gained a return. Just to state it in this way is to discount the possibility of collapse. Were anything like this state of affairs to be approached, then the value of labour power would fall drastically and investment would become more profitable. Were workers so powerful that they could push capital to the point where average surplus value became negative, then they most likely wouldn’t bother, they would abolish capitalism. 38. What is the state? The public power of coercion. The institutions that make and enforce the laws: government, parliament, the courts, the police and armed forces. The executive committee of the ruling class. There are a host of definitions. Parliamentary democracy allows for the capture of state power, including control of the police and armed forces, by a socialist majority for the purpose of ensuring a peaceful democratic revolution. As capitalism is a set of social relations, its overthrow requires people to enter into different social relations. So, unlike past state overthrows, the social revolution we want can only be brought about by a conscious majority. The controlling point for the institutions wielding state power in a political democracy and the place where socialists must be in a majority before a revolution. Be prepared for supplementary questions designed to see how you rebut the left-wingers who deny parliamentary control of the state – what about Allende in Chile? (Minority of non-socialist workers and peasants supporting a reforming government, overthrown by a league of plantation owners and a foreign investor-funded coup backed by the CIA). What about the suspension of. democracy in a crisis or war? (Upsurge of patriotic feeling may override result of last election and carry a coalition government along. But political truces, like wars, soon end). 40. What will be the attitude of a socialist if elected? Uncompromising opposition to all non-socialist members of parliament and to capitalism. A socialist MP will use parliament as a platform from which to advocate the class struggle and the overthrow of capitalism. It is possible that, as the number of elected socialists grow, governments will respond by offering as much as they can afford in the way of reforms and legislative concessions to the workers. Under such circumstances the few socialist MPs are faced with a choice that must be decided by the Socialist Party. The workers will be screwing as much as they can out of their employers; but it is possible that they could get even more when part of the surplus value appropriated by the state can be distributed to them as benefits or whatever. On such reform measures a socialist MP may be required to vote for them on the instructions of the members of the Socialist Party. 41. Do our candidates take the oath of allegiance? Yes. Although in puristic terms it might seem better to hold out against all compromise, who cares about ritual? A token requirement of swearing allegiance to a powerless monarch and a capitalist state is just a form of behaviour that only the constitutionally paralysed would consider capable of preventing a socialist from entering parliament for the purpose of overthrowing the capitalist state. 42. What are political parties? Organisations aiming to gain control of the state. They are expressions of class interest. In their attempts to gain mass support most political parties will advocate the widest range of measures they think their membership will stand. If you look at a range of such measures over time you can see how they may favour a particular class. In the hundred years up to 1914 the Tory party favoured the landowning capitalists, while the Liberal party favoured the industrial capitalists. Since 1918 the Labour party has taken over the role of the liberals. But all other political parties finally come down on the side of the capitalist class by maintaining this society. In concentrating upon socialism the Socialist Party represents the interest of the working class. 43. What is state capitalism? State ownership of capitalist industry; it is just another way of operating capitalism which leaves unchanged the exploited and subject position of the workers. The Socialist Party has never supported nationalisation, unlike the Labour Party, the Conservative Party and the Liberals (now Liberal-Democrats). After the Second World War, Labour introduced a comprehensive programme of nationalisation in the belief that this would overcome the problems of capitalism. Unsurprisingly, it didn’t and eventually Labour adopted a policy of privatisation, even including to some extent in the sacred cows of the NHS and the welfare state. State capitalism was established in the former USSR and elsewhere, and was mostly overthrown by dissatisfied workers. 44. Do we support nationalist movements? No. You should be able to knock down the Leninist theory of self-determination for all colonial peoples as a necessary prelude to world revolution. And be able to deal with the claims of Scottish and Welsh nationalist parties which think that government from Edinburgh or Cardiff rather than London would make any difference. Socialists have no interest in rearranging national boundaries or in changing the nationality or colour of the capitalist class in certain areas. Workers should just take the pattern of states as they find them and abolish the lot. 45. What is our attitude to less developed nations? That they are less developed capitalist states becoming more developed by the ordinary process of capitalist economic development. In other words, less developed nations, just as with more developed nations, are subject to the same forces of globalisation. This question is related to the Leninist theory of imperialism, wherein the advanced nations force the backward nations to trade with them at a loss (which is often true); but this is then linked into a theory of capitalist development and international exploitation, implying that the source of high wages for workers of advanced nations lies in the low wages of workers in backward nations. Our attitude to this is that it’s poppycock. Exploitation goes on at the point of production and the whole of the capitalist class exploit the whole of the working class. Workers in backward nations have got to take on their own capitalist class. Systems for redistributing surplus value across national boundaries (international aid) are just farces of political and economic chicanery. 46. Why do we oppose all other political parties? Because they do not stand for socialism alone. Some political parties are openly pro-capitalist, but some of them stand for a modified form of capitalism in the name of socialism. Some of these latter also stand for reformism, or the leadership principle, or insurrection; and all of these are obstacles to socialism. 47. Why must we be independent? So as not to confuse our aim and object of socialism with anything else. The emancipation of the working class must result from our own self-organised efforts. A party like the Socialist Party, which aims to help in this movement, must be seen to have no associations with political parties which have confused socialist consciousness in the past. 48. What is the social revolution? An immediate and fundamental change in the basis of society, brought about by a conscious democratic majority. There is a four-fold aspect to the socialist revolution. It relates to the future upsurge in consciousness on the part of the majority of workers, which may be called a revolution in social understanding. But it also refers to the democratic and peaceful use of the ballot box and parliaments for the purpose of abolishing capitalism and introducing socialism. At another level you may distinguish between the political revolution, aimed at the capture of state power, and the social revolution which follows on and changes the relations of production. 49. Do we support the general strike? We do not subscribe to revolutionary syndicalism. Socialism cannot be achieved by workers going on strike against capitalism after having previously elected a capitalist government. Nevertheless, we might be in favour of a general strike for a limited objective, like putting massive pressure upon employers to concede over pay or conditions. Another possible example of a general strike that we could support is where a government pushes through parliament a bill to make pay rises illegal. A general strike on this issue would be a way of showing that the workers were too powerful to tolerate such legislation. 50. Is leadership a necessary social function? No. For capitalism the idea of leadership may well be. It is hard to see how this society could keep going without bolstering the myth of the capitalist as the essential sea-captain ruling the economic waves. In practice ordinary workers just get on with their jobs and run society from top to bottom. Those who think themselves leaders are led by the system most of the time. In a socialist society anyone who struck up the posture of a leader and asked for followers would just be laughed at and ignored. Democracy is just the rule of the majority. In capitalist society democracy is little more than periodic elections to elect governments, national and local. But if you use democracy to elect leaders to run society for you, then you make the practice of democracy a sham. Nevertheless, as it allows the peaceful capture of state power, political democracy is something that is in the interests of the working class. In a socialist society, although the majority will get their way, minorities will be free to put their cases and sway the majority. When democracy in ownership obtains, then true social democracy can be achieved. 52. Has managerial control supplanted capitalist ownership of the means of production? No. It may well be true that managerial control has supplanted capitalist control of the means of production. Why should capitalists bother to control their factories when they can get managers to do it for them? The tasks of the capitalists now may well be limited to tearing off coupons, signing cheques and drawing dividends. Why should they do more when their managers run their industries in the interest of capital without any interference from them? However, frequent shareholder revolts resulting in the sacking of the top management show that the masters are to some extent still in control. 53. Is capitalism moving towards socialism? No. Don’t fall for ideas about the inevitability of socialism. Socialism depends on a host of factors, like there not being all-out nuclear war; and, of course, the necessity of class consciousness. Don’t mistake the fact that we’re knee-deep in mobile phones and Internet file-sharing, etc. for evidence that capitalism is creeping towards free access. This society isn’t going anywhere. 54. What is our attitude to war? Complete opposition to capitalism’s wars. War is something that capitalism drives nation states (and factions within states) into from time to time. It arises from conflicts over markets, resources, strategic locations and so on. Our attitude should be distinguished from that of the pacifist, who holds that when a majority of non-socialists reject war then wars will cease. We think this is false. As the collapse of the Peace Pledge Union in 1939 shows, pacifists are as prone as anyone to fall for war propaganda and go out and die for their masters. However, although wars between states still occur the vast majority of wars since 1945 have been wars within states (“civil” wars), in which the victims are overwhelmingly civilians or non-combatants. Between 1945 and 1999 about 3.3 million battle deaths occurred in 25 interstate wars. In the same period there were some 122 civil wars resulting in 16.2 million deaths – five times the interstate death toll. Only socialism can abolish war because, being based on the common ownership of the world’s resources, it removes the material cause of conflict. After the majority have democratically declared their intention to abolish capitalism, it is just conceivable that a minority might take up arms to prevent the introduction of the new social relations in some small localities. In such circumstances the majority may democratically decide to use force. Socialists are not pacifists. 55. What do we mean by materialism? Be careful here. This term has a number of different meanings and, unless the context makes the meaning clear, your audience may misunderstand you. In non-socialist parlance materialism usually means acquisitiveness; consumption as an end in itself. This certainly is not what socialists mean by materialism. In philosophy materialism is the view that everything that exists is – or at least depends upon – matter. Socialists can agree with that proposition, but then again so can many anti-socialists. Our materialism specifically is a materialist conception of history and social change. It is in this practical sense of the word – people and their physical conditions of life – that socialists are definitely materialists. 56. What is our attitude to new technology? Machinery competes with labour power and the thrust of capitalist production is to replace workers by installing ever more productive and “efficient” (i.e. profitable) machines. Workers are then encouraged to train in the skills the new technology may require and may then be re-employed. With a short-lived boom workers may have to wait out two or more trade cycles before finding jobs; technological changes may then be so great as to make many of them unemployable. This does not mean we hold a Luddite position that new technology displaces labour and so machines should be smashed. On the contrary, new technology generally in socialist society will lighten the load of production. A system of society based upon landowners and peasants who were tied to their place of birth, having to do unpaid labour on the land of the lord and often service in the armies levied in the name of the king or queen. However, some parts of the world (e.g. North America) have never known feudalism. 58. Did feudal peasants produce surplus value? No. They performed surplus labour upon the fields of the lord or rendered to him a portion of their own produce and these were both unpaid labour. But the products of this surplus labour did not uniformly come onto a market; they were for consumption in the manor or for exchange in the village mostly. Surplus value is a peculiarity of the wage relationship and generalised commodity production under capitalism. 59. Does poverty cause crime? Don’t get caught out on this one. You may feel some sympathy for the idea, but it is capitalism that causes crime in this society as feudalism did in the last and slavery in the previous. Crimes are transgressions of a legal code set in a background of social relations. When a feudal peasant left his village and a modern worker leaves his or hers, poverty may be the reason in both cases, but the system of feudalism causes the first to be a crime. 60. What is the purpose of standing at local government elections? A socialist transformation that aims only at national government would be unwise. It is at the town and county levels that some government powers are exercised. Socialists need to capture such powers at the same time as they go for the national strongholds of capitalism. The speakers’ test is an assessment of knowledge and understanding; it is not a test of presentation. However, on this page we do offer tips for those who want to speak in public. The following advice is not intended to produce a uniform party style of speaking; it is merely a few tips for intending speakers who are inexperienced or unsure where to start. Many of these tips will apply to the written word as well as the spoken word. 1. Tell them what you going to tell them. Introduce your talk by saying what you are going to cover and, perhaps, what you are not going to cover. (“I want to argue that…”) If you are answering a question, it may be worth repeating it so that everyone – including yourself – is clear what is being asked. Or you could perhaps clarify the meaning of the meeting’s title. 2. Tell them what they need to know. 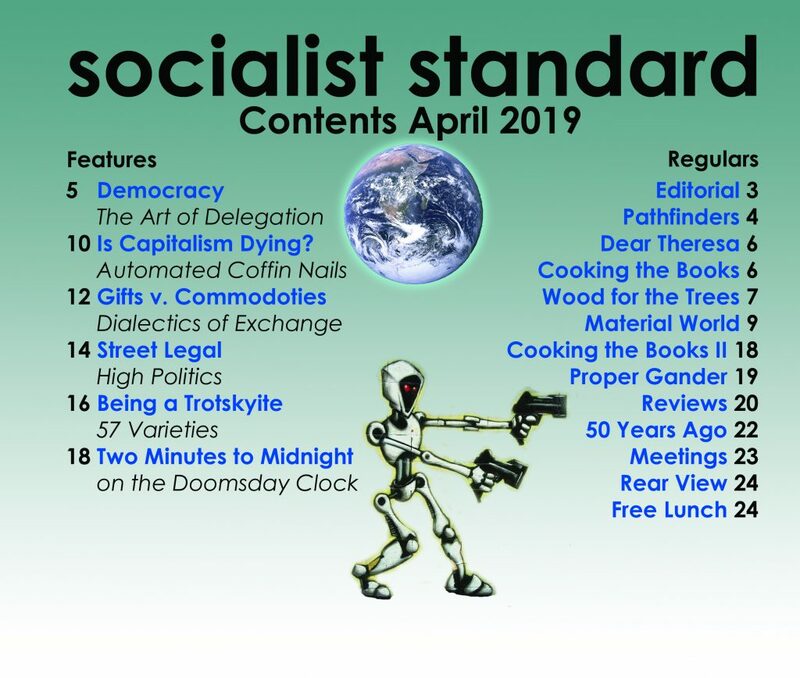 Refer to the position taken by the Socialist Party by all means, but do not quote from writers (socialist or not) unless it is directly relevant to the point you want to make. Avoid the logical fallacy of “appeal to authority” in which a speaker infers that if so-and-so said it then it must be true. If you don’t know the answer to a question, or are not sure about a point you want to make, do not try to bluff your way out. Ask another member, if one is present, or explain that you will find out the answer and get back to them. A fair-minded audience will appreciate the honesty; you can’t be expected to know everything. Try to speak from your stomach rather than your throat; that way your voice will project better and it will reduce the risk of developing a sore throat. Pronounce words as clearly as possible, with enough volume so that the person at the back of the room can hear you. Avoid a monotonous tone of voice by varying the pitch and rhythm of speech. Beware of talking too fast; your audience will switch off if they can’t keep up with you. Try to maintain eye contact with members of the audience; this will engage their interest. Don’t be afraid to pause (e.g. to look at notes); this will give you and the audience time to think. Avoid “erms” and other distracting mannerisms. It may be worth recording yourself giving a talk and listening critically to it; or rehearse a talk with a friend for feedback. You may want to time your contribution, especially if you are going to use a Powerpoint presentation or similar multimedia. But remember – effective speakers are not born that way; they are the result of practice.